RIVERSIMPLE is a hydrogen car company, aiming to produce highly efficient vehicles for personal transport. The vision is to create a cleaner world where our relationship with the car and fossil fuels has changed dramatically for the better. Caplor is an award winning family business based at Fownhope, Herefordshire since 1923. 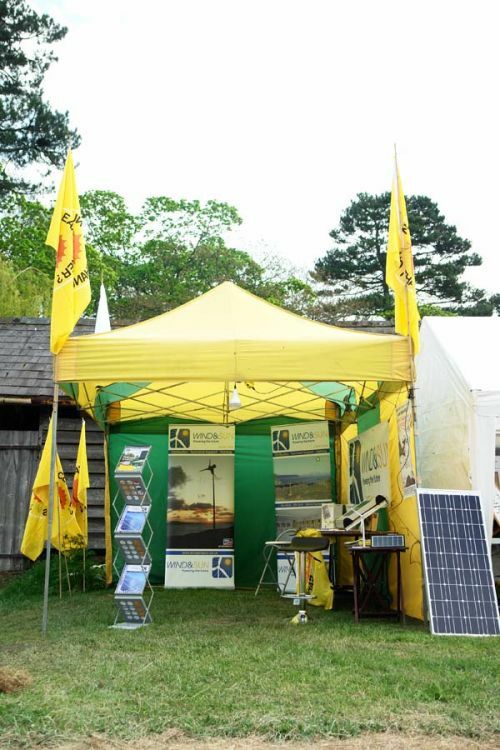 CAPLOR ENERGY is one of a number of renewable solar energy companies who have attended and demonstrated at Spring Greens Fair. WIND & SUN is a Herefordshire business, established near Leominster in 1984, which has built it’s reputation based on extensive hands on experience and has been at the forefront of the renewables industry, pioneering many applications. The Green Valleys Community Interest Company was set up by community members in and around the Brecon Beacons National Park. TGV HYDRO LTD offers design and construction for small scale hydro electric systems. HYDRO-LOGIC SERVICES is part of a group founded in Herefordshire in the 1980s. It provides a wide range of water and environmental services including flood risk assessments, water resources consultancy, hydrometric networks and hydrological advice services, and innovative web-based flood warning systems to local communities: including Bromyard and Bodenham in Herefordshire, Wychavon in Worcestershire, and many Scottish Councils. Permaculture is a design approach based on observations of nature’s systems. It is the conscious application of the principles of ecology to create sustainable human settlements. MID WALES PERMACULTURE NETWORK, regulars at Spring Green Fair, promise excitement, inspiration and fun.